I bet you never knew that the High Priestess could sing. Watch her musical debut HERE. Click on the play button. The song is “Life is Like a Boat”by the amazing Rei fu, a Japanese singer/songwriter/artist (thank you, Bill D.). I couldn’t resist doing the Empress, too: HERE. Her song is “One I Love” by Meav who appears on the Celtic Women album. And some great advice from the Devil: HERE. The first line of this piece is attributed to Heather Pryor. I can’t find the original recording. These talking pictures are made from the sample clips and web app available at PQ Talking Photo. I’ll be posting more of them. How delightful!! Gosh, what one can do with the right software! So VJ tarot readings! I gotta learn to sing! Too funny. Great find, Mary! Mary – These are wonderful! Thank you for sharing them. I’m curious about the two songs, and would like to hear the rest of them. If you could share the artists and song titles, that would be great! Anastasia – I’ll try to add the title, but the words and songs come from the selection available in PQ Talking Photo (an internet app) and they don’t give much information. 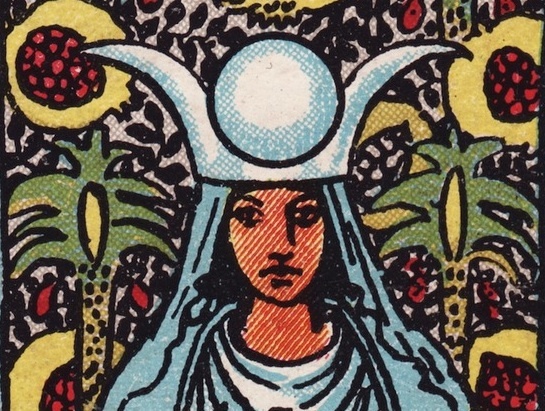 The idea of singing tarot card images amuses me. You can get the Xena episode, “Bitter Suite” on the Best of Xena DVD – high quality reproduction. I’ve watched it so many times. I love these, especially the Empress. Beautiful voice. The facial animations actually look quite real and made me think of a different tarot exercise: to sit down and listen to what the Tarot persona is saying to me. It is a different way of travelling into the card.